Jakarta, 16 July 2013 – The Alana Surabaya has been conceptualized as a sophisticated yet friendly and welcoming designer hotel and sits just of Jalan Achmad Yani nearby Surabaya’s Juanda International Airport and the Rungkut Industrial district. The Alana Surabaya has been conceptualized as a sophisticated yet friendly and welcoming designer hotel and sits just of Jalan Achmad Yani nearby Surabaya’s Juanda International Airport and the Rungkut Industrial district. The hotel features 162 airy guest rooms and suites and a wide range of facilities befitting an international business hotel including several meeting rooms, an eclectic coffee shop, a lofty lobby lounge, Surabaya’s only indoor hotel swimming pool, a full service day spa and a well equipped gym. Surabaya is Indonesia’s second largest city and the capital of the province of East Java with a population of over 2.7 million and a greater metropolitan area of more than 6 million inhabitants. As the main seaport and commercial center for the eastern regions of Indonesia, Surabaya has become one of the liveliest and largest cities in Southeast Asia. 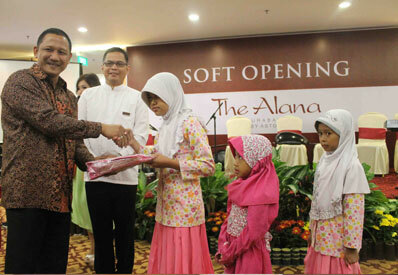 Archipelago International also said that the group plans to develop several more Alana hotels in Indonesia to offer a more playful up-market lifestyle alternative to its popular Aston properties and has several Alana Hotels under construction due to open soon in destinations such as Yogyakarta, Sentul, Solo and Bali. Alana, is the brainchild of Archipelago International, an Indonesia based hotel operator with Hawaiian roots and an underlying portfolio of more than 160 Hotels and Resorts. Alana which in Hawaiian means “fair, beautiful or offering “ , offers high end lifestyle boutique hotels that are sophisticated yet friendly and welcoming for a traveler who appreciates style, personalized service and a stimulating environment. Alana Hotels are set apart by presenting an extra dimension of escapism, namely the chance to experience, however briefly, a lifestyle that is glamorous, fashionable and exclusive. Archipelago International (formerly known as Aston International) is one of Indonesia’s leading hotel operators with an underlying portfolio of more than 60 hotels and 12 000 rooms and a development pipeline exceeding 90 properties in Indonesia, the Philippines and Malaysia.